[Macfadden Books 50-203. 1964. An Inspector McKee mystery. Luridly splashy cover art by an uncredited artist]. 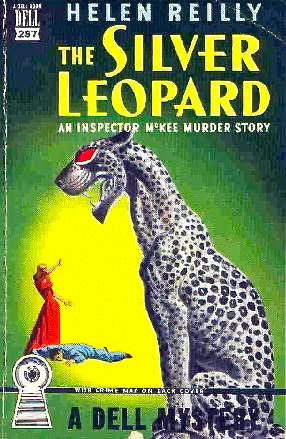 The prolific Helen Reilly has been well served by the covers of her books; that Dell Silver Leopard cover in particular is an absolute classic[! ], over-the-top even by the most sensationalist standards of the vintage pb’s peak years. I’m not too familiar with Macfadden Books, the publisher of our present title. It’s my impression that they came to the vintage paperback party a little late in the day, and, fair or not, I tend to think of them as decidedly second-tier. But they did produce some cool cover art that recalls (in a 1960s sort of way) the vintage era’s pulpiest, pinch-of-trash publishers like Avon, Eton and Graphic. 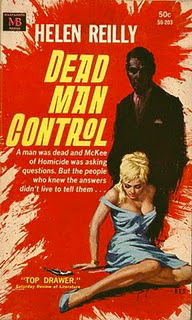 And indeed, the Dead Man Control cover, with its early sixties vintage, does arrive a little late in the classic cycle, but who cares? What a cover! How can you ever go wrong with a bright red backdrop and yellow lettering? By the way – what about that title? What exactly is ‘dead man control’? Something to do with zombies?. Anyway, things I like about the cover : the splashy, choppy red color which dominates the cover; the shadowy figure of the P.I. lurking in the background ; and the girl’s late 50s hair style, blue dress and matching blue shoes.